** NOTE *** These items are NOT returnable. Please contact us if you have any questions before ordering. These discs are direct replacements for your Stasis/Alcon BBK. They will bolt on and are directional so you must order a Left and a Right.We also suggest replacing your brake pads and hardware when buying new rings. Replacing the pads at this times guarantees better rotor life and better break-in than using old pads. Advantage Extreme discs have been engineered to produce optimum bite, thermal stability and durability in an exceptionally high strength to low weight design. 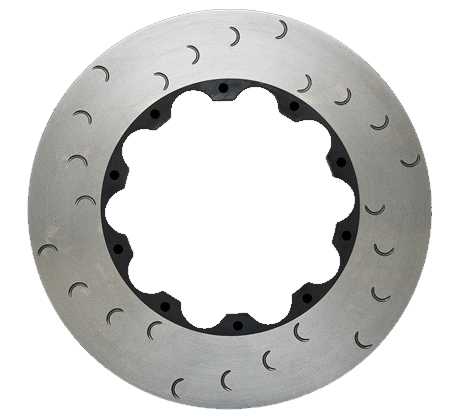 This hasbeen achieved by combining a special Alcon developed iron alloy disc with an aerospace specification alloy bell. Unique crescent grooves on friction faces provide the bite usually associated with drilled discs without the attendant durability problems. Alcon's floating disc system (as used in the majority of applications) has been designed to allow thermal expansion of the disc throughout it's life while minimizing the tendency to shudder. This part is the Disc ONLY. Need help installing? See our installation guide here. STaSIS rotor replacement guide. Stasis 328mm x 32mm Discs (Pair)Stasis 355mm x 32mm Discs (Pair) by Phenom.